This was originally planned many months ago as a potential fill-in Ogg-Cast, that I could prepare in advance, so that if I ever didn’t get the time to make one, there wouldn’t be a gap in the schedules. Fortunately, I do have time, and so this episode has been made as normal, with the due care and attention given to it you’ve come to expect. 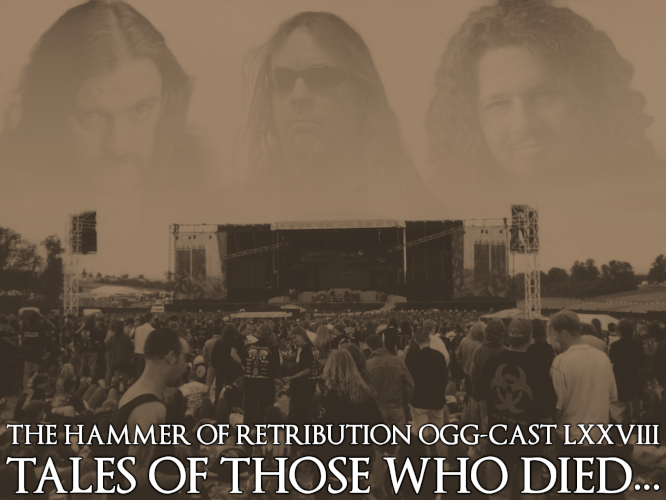 The concept was, if I could identify every band I’ve ever seen live featuring someone who has since died, I’d see if there were enough of them to make a decent-length Ogg-Cast. Some of the names were obvious – Lemmy, Jeff Hanneman, and now both the Abbott brothers; others were obvious to me but may not have been to the casual listener, such as Jay-Jay Winter and Paul van Linden. Then, I had to take a last look through Metal Archives’ R.I.P. page and find out how many I’d missed that I’d been unaware of. In the end, I had 26 bands for the show, and Lennard contributed… one, mainly due to his live experience only extending back to about 2012, rather than 1995 (when he wasn’t even born). Part One covers the obvious three I’ve mentioned, plus some leading lights from death and black metal… with a couple you really wouldn’t expect me to include. In Part Two, it’s the names that were obvious to me but not the casual listener, some heroes of thrash from past and present, some more unexpected entries… and a short man who looked like a goblin but was revered by everyone. And for Part Three, we have Lennard’s “seven-inch Tunes of Yore”, some more departed members of the UK underground, some loose ends… and the most recent addition to the candidates for this playlist. Raise a horn of mead to those who died, and who I saw on stage while they were alive.